"Plot 40, with special amenities for cultivation from wheel chairs, is making good progress with an opening date scheduled for Show Day on 7 August 2010. We have asked the Mayor to do the honours. A huge vote of thanks is due to all those that have helped to provide this first class facility with willingness and hard work. The weather has been kind to us. Ron, in particular, started off as the white tornado and finished as the brown tornado! I attach a list of the names that I managed to collect, although I think one or two slipped past my pen & paper!. Many thanks indeed to all of you for a job so well done! It's great. A rough calculation leads me to believe that over 200 hours have been put in by our generous members. The next step will be to find suitable allotmenteers. We are proposing to publicise the plots (perhaps 3 of 3 raised beds each) and to encourage applications from individuals. We have also benefitted from some very generous donations of material from local suppliers and that list is also attached. It is the pouring today of 6 cubic metres of concrete, donated by New Milton Concrete Ltd , that marks a milestone that prompts this vote of thanks. Many thanks to all of you. We have a facility that we should be proud of." With thanks to.... Carol & Neville, Laurie & Sandra, Richard, Ron, Sid, Neville, John, Dave Webb, Dave Atyeo, Keith, John, Mac, Steve, Fred, Mike, Eddie, Hugh, Pete, Kay, Crystal, Franco & Son, Monica & Jack, Peter for the generator, Linda for the tea's & mince pies. Allotments for Christchurch residents with mobility problems. Roeshot Hill Allotment Association has constructed three independent allotment plots specially adapted for Christchurch people with mobility problems. The facility has been constructed with the help of material and plant donations from New Milton Concrete, Christchurch Borough Council, Travis Perkins, Brandon Tool Hire, Stewarts Gardenlands, Hoburne Developments, Waitrose and RMH Construction, and for that help, many thanks. In excess of 300 hours of voluntary work by other allotment holders was involved in the project, which is now complete. Many thanks go to those volunteers. 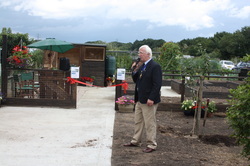 The plots were opened by the Mayor, Councillor Nick Geary, Council Leader Alan Griffiths and, a particular friend of the allotment site, Councillor Josie Spencer on 7 August 2010.